Sometimes we get outta whack. It can be your health, your job, your relationships, your schedule…whatever. The last two weeks for me have been a bit of chaos. It’s no secret that I’m on Weight Watchers and did great the first five weigh-ins, but then came the last two weeks. The routine was upset. Vacation happened. I got off my last prescription drug and suffered some awful withdrawal effects. My Valentine was traveling on Valentines. My in-laws moved in with us. I spoke out against a potential new development project in our downtown (in the vocal minority), and my diet was being sabotaged at every turn. Yes, ‘outta whack’ sums up my state. I started it off at my Saturday morning accountability check at Weight Watchers. Much to my surprise I DIDN’T gain weight last week (I guess Girl Scout cookie Thin Mints really are ‘thin’) and actually lost 1.2 pounds from last week. What have I learned about being outta whack? I think being ‘off’ is the reminder to us to embrace the everyday normal that is mostly taken for granted. When I was recovering from surgeries and couldn’t mow the law, it seemed I just wanted to mow the law. But when things are normal and I’m mowing the lawn, do I think about how lucky I am to be able to get outside and actually mow the lawn? The answer is ‘no.’ When we are in a routine our lives get into an automatic pilot state. It can almost be zombie-like some days, getting up, going to work, making dinner, going to bed and repeat. Let me digress a bit. Part of my routine involves watching “The Biggest Loser” TV show. It inspires me to lose weight and to live a healthy lifestyle seeing really obese people trying to change their lives. But what gets in the way of these real people who have real fat and real problems? The drama, the chaos that insures each week over petty things blown up to make a reality show ‘interesting.’ The ‘baggage’ (emotional and physical) they brought with them to the Ranch. What I do like is the theme this season: No Excuses. How many times in my life have I given excuses for how I act, what I eat, what didn’t get done (or done well enough) or why I haven’t moved ahead on an idea. My excuses. So, I want to recommit today to moving out of chaos and being outta whack to making good choices and focusing more on setting and reaching some personal goals. Will I do the Avon Walk in June or not? Do I want to push ahead my new business idea or just make it a hobby? Like I mentioned earlier, I weighed in this morning at 6:30 and realized that is a great start to reframing my week. Unbelievably I also lost 1.2 pounds. I also turned down a ticket to a community pancake breakfast this morning where I would be temped to eat too much of the wrong foods so I stayed home and blogged instead. I ate a small bowl of Kashi cereal and feel empowered for the week ahead. It all boils down to choices and as the fog has cleared my head from detoxing off Cymbalta (dizziness, fatigue, nauseousness), a wonderful feeling of peace and ‘just being’ envelopes me. Things are starting to come into focus for me. And no, it is not just the new glasses. P.S. The photo above was taken last Saturday on a wonderful visit to Lost Dutchman State Park in Phoenix, AZ. 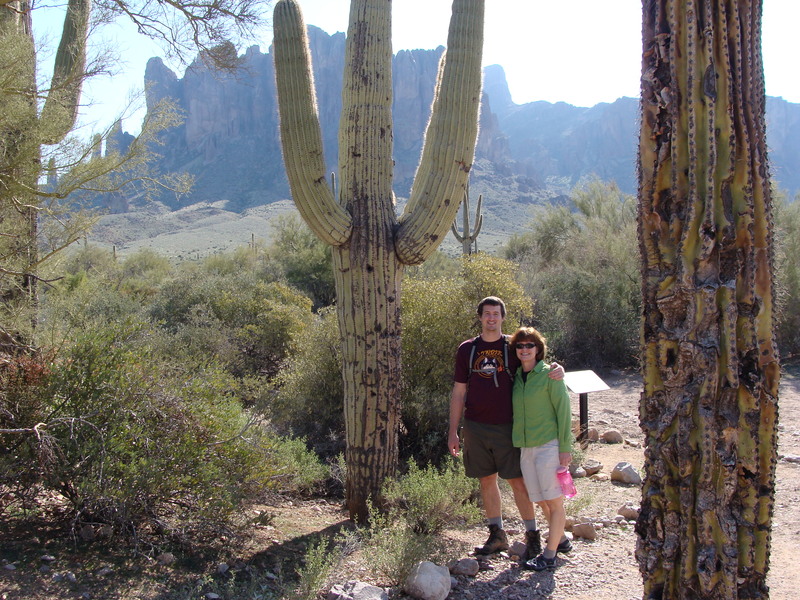 My son, Owen and husband and I hiked up Superstition Mountain. OK, we didn’t reach the top, but I was challenged beyond my comfort zone and was back out doing what I love to do with two of my favorite peeps.